I discovered the "This is Teen" event through Twitter as well. 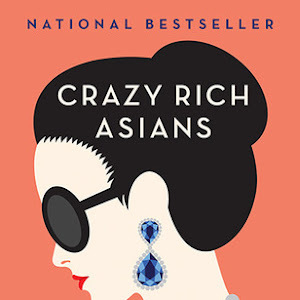 Some of my favorite book bloggers (like Kristi from The Story Siren) mentioned it, and I also saw it through Meg Cabot and Maggie Stiefvater's tweets. 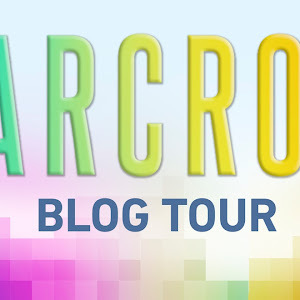 Two of my favorite authors and one of my book blogging idols talking about it? This was definitely something I had to check out. According to the official website, "thisisteen is not just about books. It's about the experience of reading and relating. It’s about connecting with those who have similar likes and interests. And it’s about connecting with the authors who inspire us in a way no one else can. thisisteen.com brings people together to exchange ideas with authors and friends, share photos and videos, discover the joy of writing, and win great prizes." With a premise like that, how, do you ask, could it get even better? 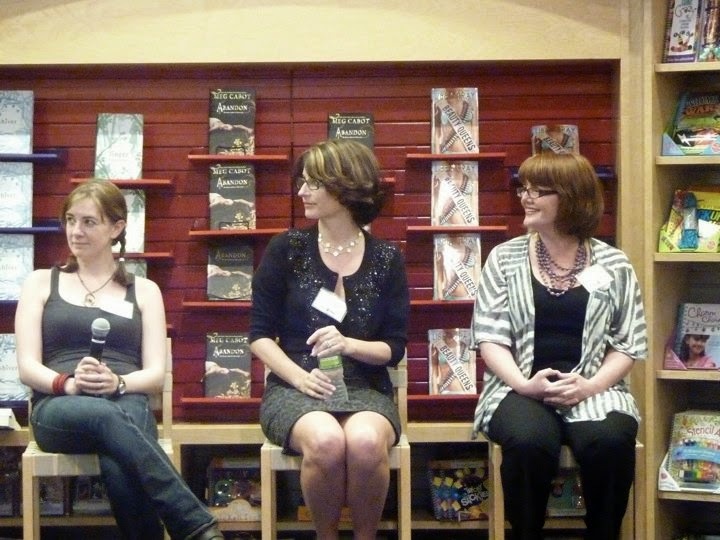 Well, for one thing, I discovered that This is Teen would be having an event in the Scholastic Store in Soho, NY -- and Meg, Maggie and Libba Bray would be there. This was an exciting opportunity to meet two of my favorite authors, as well as finding myself introduced to another one (who I ended up liking just as much!). Of course, without hesitation, I knew I was going. This time, however, I didn't have to go alone - my best friend Pamela, who is also a big Meg Cabot fan and likes reading too, came with me. 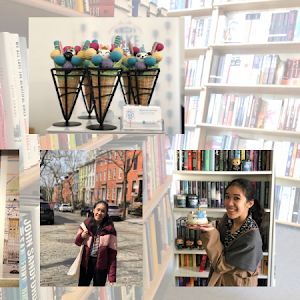 After I had purchased a book by each author (although I was sorely, sorely, sorely tempted to buy many, many more, I assure you) and we had gone off to eat, we returned just in time to join the crowd gathering for the This is Teen public event. I felt a growing sense of anticipation as I spotted the three empty chairs just in front of us - it was really going to happen! When Maggie, Meg and Libba came out, my first thought was (and this is in all honesty) - they're just like me. I thought they were brilliantly cool, but there was also an interesting nerdy girl, bookish girl vibe to them, just like I myself give off, I suppose. I instantly felt like I could relate to them, that these women were people I knew and that I would probably hit it off with, given time. During the whole question and answer portion, each author surprised me in many ways. Maggie, for instance, was quite laidback and nonchalant, and I loved that vibe I got from her. Meg, on the other hand, is just like she is on her blog, witty and sharp and endlessly entertaining. 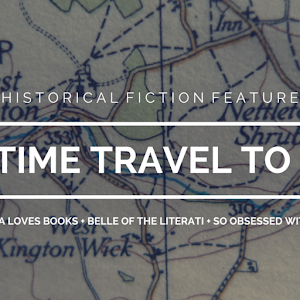 And I was pleasantly surprised by Libba, who was funny, quirky and friendly (and this made me an instant fan of hers, despite never having read any of her books!). The authors discussed everything from their writing inspiration, their research methods and advice for budding writers. As I listened to each of them speak, I couldn't help thinking, "These women are all amazingly talented authors, who have written books so many people have loved. I aspire to be just like them someday." Together and as individuals, they were powerful women. I think the best part though was how funny they were and how eloquently they expressd themselves. It was such a treat to laugh at their jokes and wisecracks, and to just listen to them speak about just about anything (wolves, beauty queens and lords of the dead were amongst the things spoken about, FYI). After their panel, each author got assigned a table for their signing (and I love how Maggie was excited to be in the Magic School Bus!). 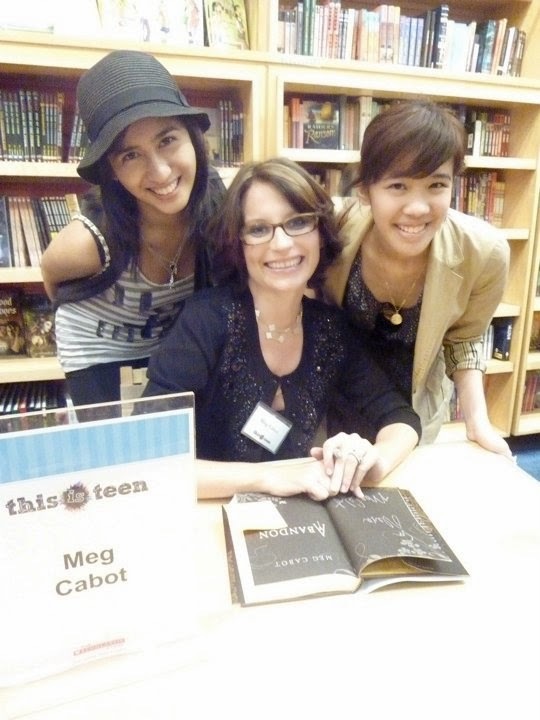 Pam and I immediately made a beeline for Meg Cabot's table, eagerly waiting as the line inched forward. When we finally got a chance to meet Meg, it was all I could have hoped for. I have never been that starstruck in my life, to be honest! She was so funny and so enthused about meeting her fans, which I really loved. I got a chance to tell her how much I loved her blog, which was something really important to me. And Pam was really excited when Meg complimented her on her hat! 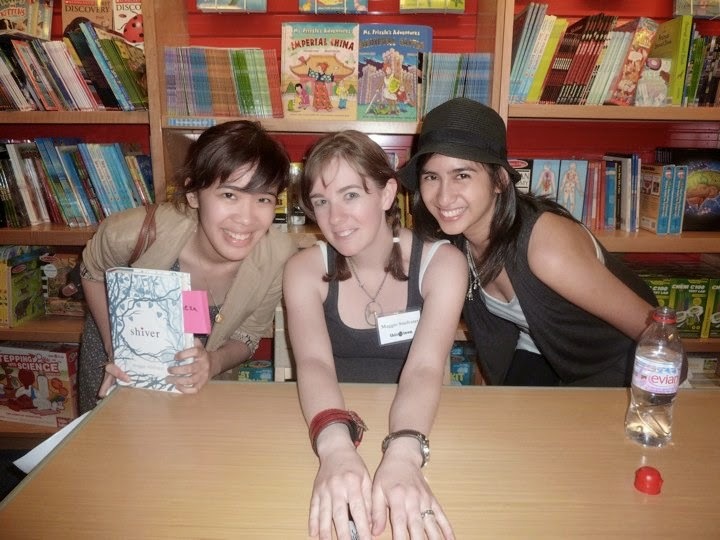 Childhood/booklover's dream come true - that's basically what this moment was for us. And, as an aspiring writer, I am still in shock over meeting one of my writing idols. Our next stop during the signing was Maggie's post in the Magic School Bus. Two things - we were excited to actually be in the Magic School Bus (which was totally part of our childhood) and we were excited to meet Maggie, who we felt was just as mischievous and fun-loving as we were. She was lovely and cheerful and it was great getting a chance to meet the woman behind the Shiver trilogy, one of my favorite series. Our last stop and the longest wait of the night was for Libba Bray's signing. We didn't mind the wait though because she was totally awesome! I'm super excited to read her book "Beauty Queens", especially after hearing great reviews from the people who were in line with me. Pam and I felt seriously in awe when she told us we were "fashionable" and that we had a "totally cute" picture with her. She's so awesome, seriously. New author I think I'm going to love alert! While we were waiting in line for Libba Bray, I think I got just as starstruck as I did seeing Meg Cabot when I saw Kristi of The Story Siren fame. She's seriously so pretty in real life and I was totally spazzing while I told Pam about her. I wish I had had the guts to walk up to her and ask for a photograph, but then she made my day when she tweeted me back. I love you Kristi! 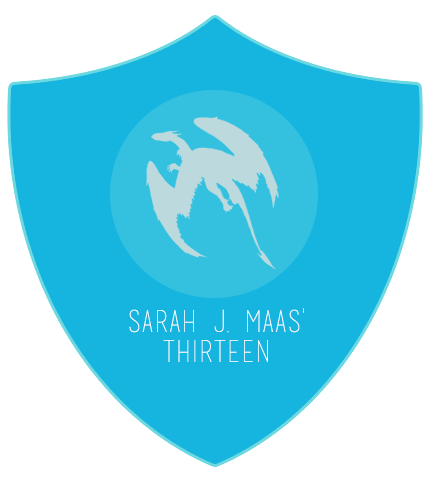 I think The Story Siren is awesome and you were the one who really inspired me to start this blog in the first place. We lingered in the Scholastic Store for a bit after getting Libba's autograph because we saw so many things that reminded us of our childhood and our early reader days. Everything from the Berenstein Bears to Arthur to Clifford to Dr. Seuss to Goosebumps to Animorphs - it was all laid out beautifully in the store. I think I've just found my new favorite place in New York City. All in all, This is Teen was an amazing experience. I'm extremely glad to have been a part of this wonderful event, and best of all, to share the experience with my best friend. 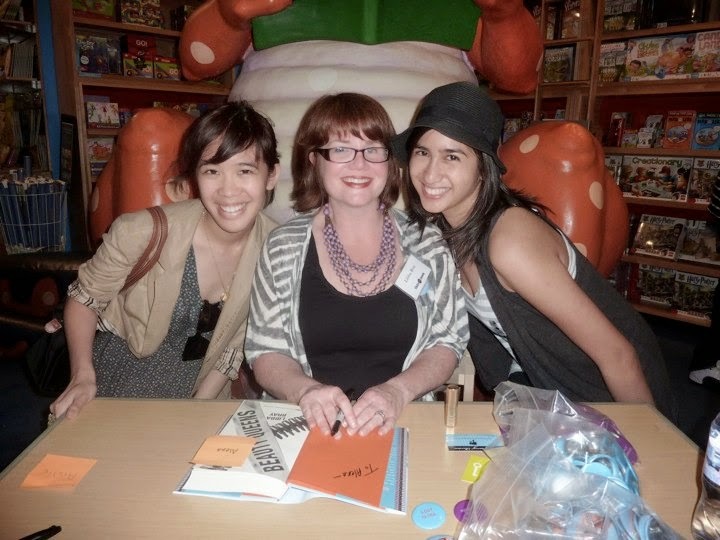 More power to This is Teen, Meg Cabot, Maggie Stiefvater and Libba Bray! Found you through Libba Bray's retweet of your post. It was a fantastic signing and I'm so glad I got to go as well. These are some great, funny women. Loved your recap! I think it's so cool that we did finally end up meeting later on (well, about a year later). That signing was pretty darn fun!